A Metropolitan Transportation Commision chart showing funding sources for housing. 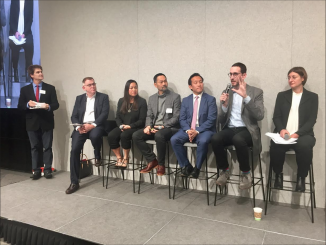 A group that wants to increase the housing supply in the Bay Area is looking at ways to fund its efforts, which could potentially include a sales tax increase, an employer “head count” tax, or a tax on vacant houses. Those are a few of the ideas under review by CASA, or Committee to House the Bay Area. The group was formed last year by the Metropolitan Transportation Commission, a regional planning agency for the nine-county Bay Area. CASA has roughly 50 members that include local government officials and representatives of businesses and nonprofits. CASA is proposing a multi-pronged approach to the region’s housing crisis that it calls the “three P’s”: producing more housing at all levels of affordability, preserving existing affordable housing, and protecting residents at risk of losing their housing. But to accomplish its goals, the group would need about $1.5 billion per year, according to Steve Heminger, MTC executive director. Heminger has recommended a “share the pain” strategy to raising funds, with contributions from property owners, developers, employers, local government, residents and philanthropists. Heminger presented more than a dozen possible fundraising measures to the committee, with an eye toward raising $100 million a year from each. For example, raising the sales tax throughout the nine Bay Area counties by one-sixteenth cent is estimated to raise that amount. So would a 3.35% “windfall tax” on home sales, MTC estimated. The proposal would tax the portion of capital gains not taxed under the federal Taxpayer Relief Act, after adjusting for inflation and deducting expenses associated with the sale. A regional parcel tax of $48 a year would also raise $100 million annually. The $48 tax would be four times the amount of the recently approved Measure AA, a regional measure that will raise about $25 million a year to protect and restore San Francisco Bay. Another idea would be to tax homes that sit vacant for more than six months in a year. Second homes and short-term rental properties would be subject to the tax, under the proposal, while homes that serve as the owner’s primary residence or are vacant due to renovations would be exempt. A tax of 1% of the homes’ assessed value would raise about $100 million a year. MTC noted that Vancouver, British Columbia, adopted a similar tax last year. Some of the taxes would require action from the state Legislature, and some would need voter approval. An entity to collect the tax money would need to be established. In another proposal, developers could be charged from $2 to $8 per square foot of commercial development to go toward the regional housing initiatives. Under the preliminary proposal, the fee would vary depending on whether the project was in an area served by transit, the number of employees to work at the new location, and the jobs-housing ratio of the area. A “head tax” charged to businesses based on the number of workers they employ might also vary based on similar factors. MTC presented an annual head tax ranging from $8 to $64 per job, to meet the goal of raising $100 million a year. 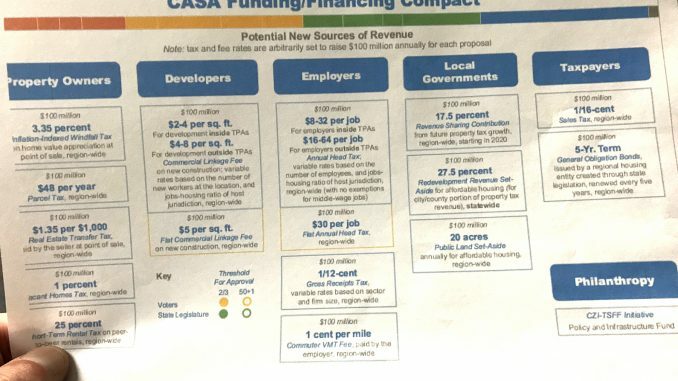 The tax proposals are all preliminary at this point; CASA’s Technical Committee and Steering Committee are expected to weigh in on them next month. CASA may wrap up its work with a final report as soon as the end of the year. How a new, regional tax such as a developer fee would work in cities that already charge developers a similar housing impact fee has yet to be determined. CASA Technical Committee member Mary Murtagh of EAH Housing said areas that have already stepped up to help fund affordable housing should be recognized in CASA’s process. She mentioned ​Santa Clara County, where 68% of voters in November 2016 supported Measure A, a bond measure to raise $950 million for affordable housing. Measure A allows the county to increase the property tax rate to pay debt service on the bonds. In the same election, San Mateo County voters approved Measure K, the renewal of a half-cent sales tax used for a variety of purposes, including housing. The measure raises about $85 million a year, with about 28% of proceeds going to housing. CASA is an outgrowth of Plan Bay Area 2040, a long-range plan developed by MTC and the Association of Bay Area Governments or ABAG, another regional planning agency. One of the action items in the plan is establishing regional sources of funding for housing, rather than relying solely on state or federal money. Unbelievable!! More taxes! When will this picking our pockets ever stop!! Best you spend within your budgets and stop tax increases on the public. With 50% of the population leaving CA, who will be left to support government appetites? Here’s a crazy concept. Have people pay for their own housing, and if they can’t afford any homes here, they move to a more affordable place. If the companies can’t retain employees, they raise their wages. Let’s have government stay out of this and let individuals make their own decisions based on their own interests. Is this the same MTC that spent $258 million of tolls and funds on a new building (>50% over budget) for itself and its cohort, ABAG? Refresh your memories of that fiasco. In addition to its fancy digs, this is the agency that oversaw the Bay Bridge, a 100-year….oops 50-year…marvel of engineering and construction, only years late and over budget. The new Transbay Terminal, which is already experience structural failure. And the Clipper Card, which any visitor to a truly transit-oriented metropolis would recognize as a lame effort, especially in the cradle of high tech. Like BART, another model organization, I want it to expand its reach and get involved in property affairs when it can’t even fulfill its primary objective competently. Right. Great idea. This should frighten any property owner in the Bay Area. Here’s a radical idea. Instead of more and more taxes and government intervention, how about we concede that the government cannot and will never be able to build the housing we need in this region. How about we give the free market a shot at solving the problem. Stop taxing new home construction to death. Stop the NIMBY veto of new home construction. Allow people to build to the maximum allowable density on their own land. How about we give that a try for a while before we raise taxes by another couple of billion so they can be pissed away by the poverty industry.